Hello, students and family members! You are the most important part of what we do here at 826 Valencia. We’re so glad you’re here. On this page, you’ll find resources for getting involved with 826, links to student writing, and more. Our evening and weekend writing workshops are free and open to anyone. We have a variety of tutoring, homework help, and writing programs after school. 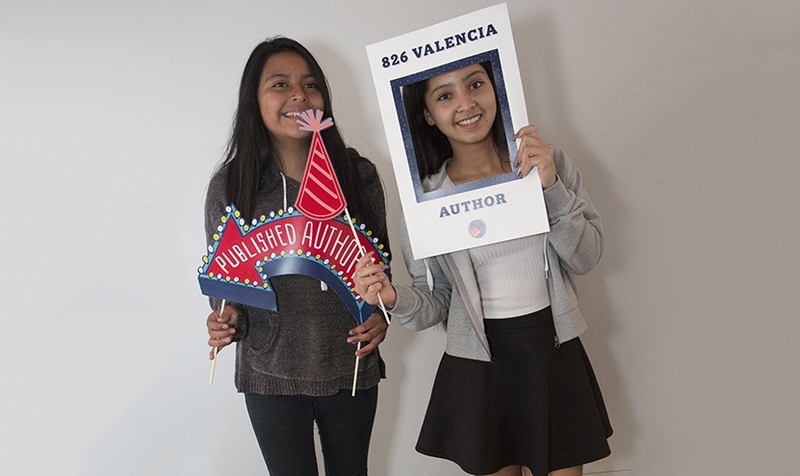 Learn more about volunteer and internship opportunities at 826 Valencia. How do I sign up for your programs? Enrollment happens in a variety of ways at 826. Anyone can sign up for our workshops or attend our drop-in tutoring hours on Sundays at our Mission Center. Other programs are filled from a waitlist, through community partners, or via school partnerships. Check out the quick links above to learn more about how enrollment works for each program. I’ve been on the waitlist for After-School Tutoring for a long time. When will I hear back from you? It’s true: our After-School Tutoring Program is full, prioritizes returning students and families with economic need, and has a long wait list. We aren’t able to open up spaces very often. If you have questions about the waitlist and how it’s maintained, or want to confirm that you’re actually on it, contact Programs Manager Kathleen Rodriguez at kathleen@826valencia.org. Can I just drop in and get help with my homework? On Sunday afternoons from 2:30 to 4:30 at our Mission Center, yes you can! I was published! How can I see and share my writing? Congratulations, published author! Authors get one free copy of their publication, and additional copies are for sale in our stores. If you never got a copy of your publication, you can pick it up in our stores or by contacting your program lead any time. If your writing was published online, you can find it here. We hope you share it far and wide! I’m an alum of 826 programs. How do I stay involved? You are a super valuable member of our community, and we very much want you to stay involved for many years after graduating! Sign up for our newsletter to learn about events and job opportunities. Check out volunteering and internships to learn about other ways to get involved. And come by and say hi! We love to hear from our alums and learn what you’re up to.